Action in the 2015-2016 PBA Philippine Cup continued to heat up this weekend with big wins by San Miguel Beer and Mahindra. Rain or Shine also snapped Ginebra’s winning run, while GlobalPort put a halt to their losing skid. 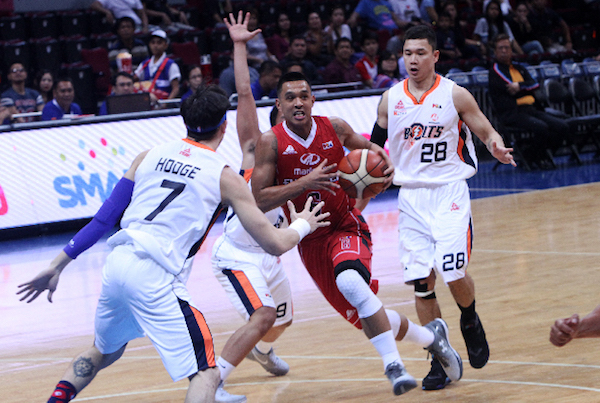 The Mahindra Enforcers managed to hang on in the end-game to hold off the Meralco Bolts, 86-83, to snap a four-game losing skid in the SMART BRO PBA Philippine Cup Saturday at Mall of Asia Arena. Aldrech Ramos scored 15 points and nine boards to lead a balanced Mahindra attack that saw five players in double digits. Mark Yee added 14 points, Kyle Pascual and LA Revilla, who made a game-saving block, each had 12 and John Pinto made 10 as they improved to 2-5. 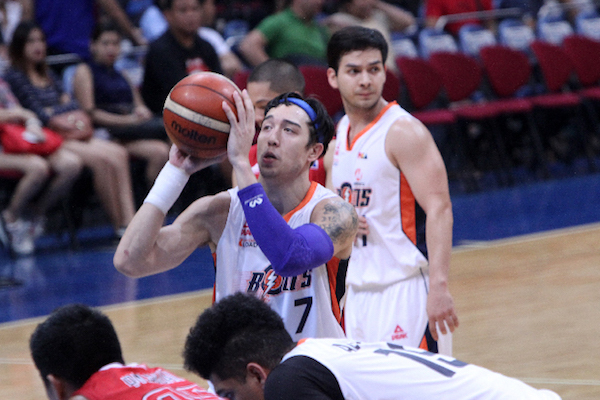 Gary David scored 18 points to pace Meralco, which remained at the cellar with a 1-7 card. Aldrech Ramos (MAH) - 15pts, 9rebs, 1ast, 1stl, 3 triples. Cliff Hodge (MER) - 14pts, 20rebs, 2asts, 1blk, 6/10 FGs. Cliff Hodge had a monster game for Meralco despite the loss. Karl Dehesa and the Enforcers surprised the more fancied Bolts. 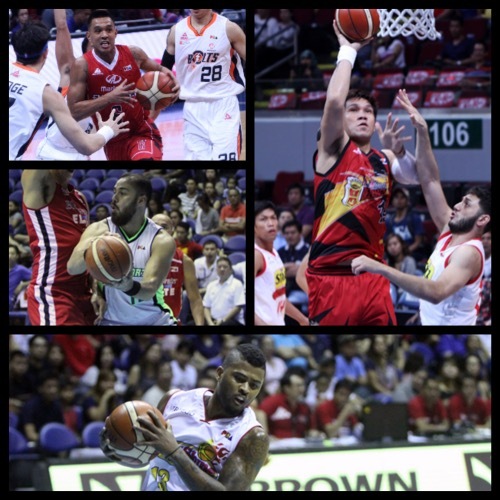 Defending San Miguel Beermen continued their roll this conference after trouncing the Star Hotshots, 101-88, in the SMART BRO PBA Philippine Cup Saturday at Mall of Asia Arena. June Mar Fajardo was business as usual, registering 27 points and 16 rebounds as the Beermen (6-1) won their fourth straight game to keep pace with Alaska on top of the standings. Arwind Santos added 22 points and seven boards, including big baskets in the fourth quarter that thwarted a comeback attempt by Star. 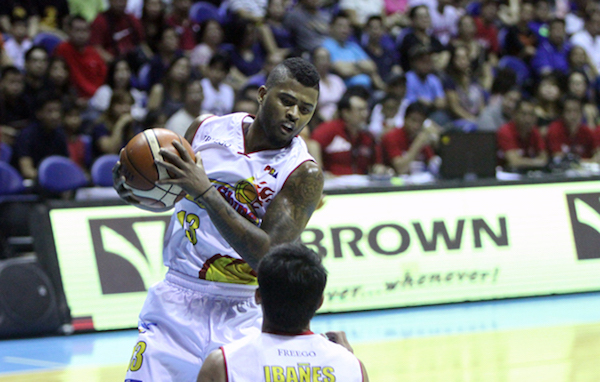 Star slumped to its fourth straight loss to settle for a 2-5 card. 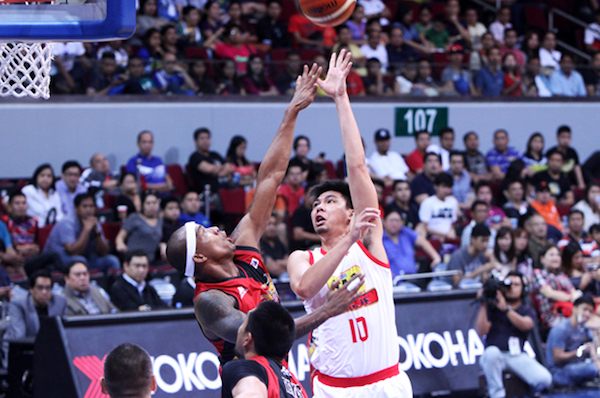 James Yap had 22 points to lead Star, which fought tooth-and-nail against San Miguel in the first two quarters. June Mar Fajardo (SMB) - 27pts, 16rebs, 1ast, 1stl, 1blk, 12/17 FGs. Mark Barroca (STA) - 15pts, 8rebs, 4asts, 4/8 FGs. Ian Sangalang tries a baby hook over Gabby Espinas. 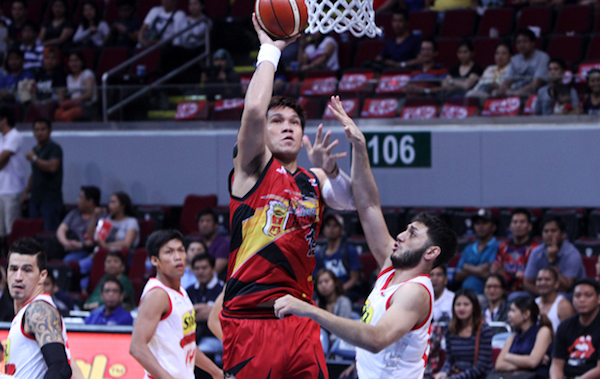 June Mar Fajardo unloaded big numbers again as the Beermen beat the Hotshots. The GlobalPort Batang Pier showed off their offensive firepower as they outgunned the Blackwater Elite, 120-105, in a high-scoring SMART BRO PBA Philippine Cup clash on Sunday at the SMART-Araneta Coliseum. Terrence Romeo scored 26 points to lead the Batang Pier, who snapped a two-game losing streak. There were plenty of other contributors for the GlobalPort side, though. Stanley Pringle added 17 points six rebounds and six assists while Doug Kramer had a huge double-double with 16 points and 15 rebounds. Joseph Yeo added 14 – all of them in an explosive first half – and Rico Maierhofer chipped in with 12 points and nine boards. 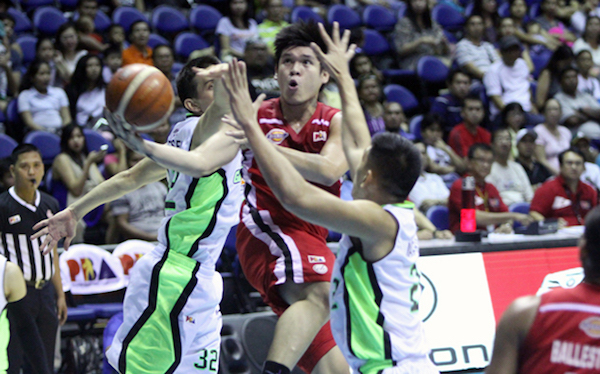 The Batang Pier, now at 4-3, forged a three-way tie for fifth place alongside Barangay Ginebra and NLEX. Carlo Lastimosa set a new career-high with 31 points – 23 of those in the first half – to lead Blackwater, which dropped a fourth straight game to fall to 1-6. Terrence Romeo (GLO) - 26pts, 5rebs, 1ast. Carlo Lastimosa (BLA) - 31pts, 4rebs, 4asts, 1stl, 13/23 FGs. Carlo Lastimosa was nearly unstoppable for the Elite. 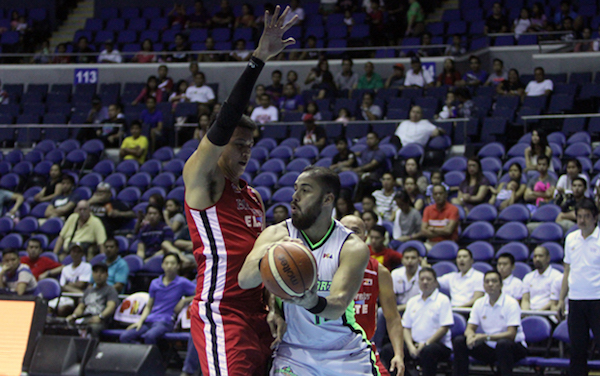 Doug Kramer was solid as the anchor for GlobalPort against a taller Blackwater squad. The Rain or Shine Elasto Painters doused a late Barangay Ginebra rally to seal a 94-86 victory for their third consecutive in the SMART BRO PBA Philippine Cup on Sunday at the SMART-Araneta Coliseum. Jeff Chan scored a team-high 19 points, 14 of those in an impressive fourth quarter performance, to lead the Elasto Painters to a 6-1 record, tying Alaska and San Miguel on top of the standings. Rain or Shine got the job done in usual team fashion with Jericho Cruz posting 16 points and rookie Maverick Ahanmisi adding 13. Beau Belga added nine and Gabe Norwood eight for the Elasto Painters. 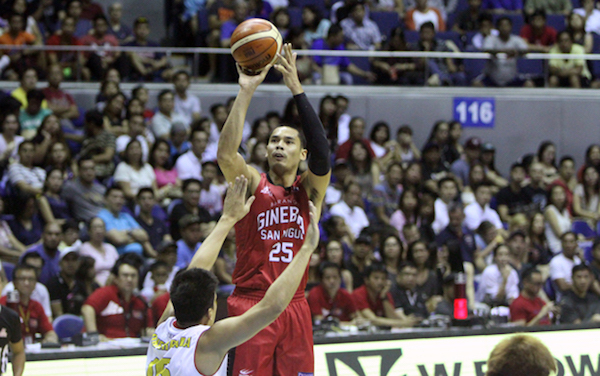 Japeth Aguilar led Ginebra with 22 points and nine rebounds while Greg Slaughter had 19 and seven. Maverick Ahanmisi (ROS) - 13pts, 6rebs, 3asts, 1stl, 6/9 FGs. Japeth Aguilar (GIN) - 22pts, 9rebs, 3asts, 1stl, 8/16 FGs. Japeth Aguilar registered a great line for Ginebra, though it wasn't enough to pull them out with a win. Maverick Ahanmisi continues to impress in his rookie season in the PBA. 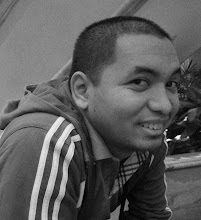 Images are from the PBA.